VATICAN CITY (CNS) — The early November feasts of All Saints and All Souls call Catholics to contemplate their ultimate destiny, hope in the eternal happiness of their beloved dead and remember the thousands of innocent people dying each day because of human evil and selfishness. 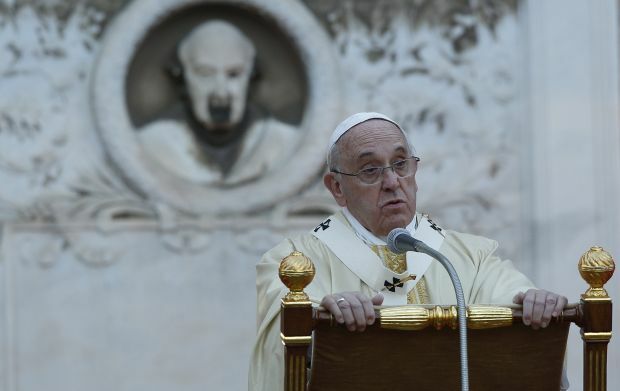 Because human beings believe they are gods and the lords of creation, they discard the poor, the old and the young, they wage wars and persecute those who do not believe the way they do, Pope Francis said Nov. 1 as he celebrated an evening Mass at Rome’s Verano cemetery. As winter begins in the Northern Hemisphere, he said he was thinking of the thousands of people forced to leave their homes and flee to the desert, living “in tents, feeling the cold, without medicine, hungry” because of those who believe they are god. The pope presumably was talking about the situation in Syria and Iraq where Islamic State fighters continue to drive people from their homes. God has given his children a blessing, the pope said: “hope. The hope that he will have pity on his people, that he would have pity on those who are in the midst of the ‘great tribulation'” described in Revelation 7:14. Earlier Nov. 1, reciting the Angelus with visitors in St. Peter’s Square, Pope Francis said the November feasts are reminders that all the baptized — those living and those dead — are united in Christ forever. Leading visitors in St. Peter’s Square in the recitation of the Angelus prayer again Nov. 2, Pope Francis spoke about All Souls’ Day and the importance of praying for the dead — both loved ones who have passed away, but also unknown people who have no one to mourn for or remember them. After praying privately at the tombs of previous popes in the Vatican grottos the evening of Nov. 2, he celebrated Mass in St. Peter’s Basilica Nov. 3 for the 10 cardinals and 111 bishops who died over the last year. The deceased included Cardinal Edmund Szoka, former archbishop of Detroit and former head of the commission governing Vatican City State. He died in August at age 86.